How Do You Know When “It’s Time”? | Will My Dog Hate Me? How Do You Know When “It’s Time”? I was planning to report on the excellent Nestle-Purina Webinar on pet aging that I participated in on Thursday, but don’t yet have the details fact-checked. In the meantime, there’s a related topic — related not only to pet aging but to the recent rancorous discussions about human health care, especially the bogus “Death Panels” — that’s important to address. It’s ironic that we’re often forced to make end-of-life decisions for dogs, who can’t tell us what they want, but are often prevented from carrying out the wishes of humans, who can. Perhaps we should be grateful that, if we’re powerless to design the deaths we might desire for ourselves and for our human loved ones, we can provide them for our pups, shielding them from prolonged pain and suffering. The hard part: getting past the selfish desire to keep our dogs with us just a little bit longer, providing just one more treatment, one more surgery, because we can’t bear to let go. I am, I hope, a long way from having to deal with the question of deciding when it’s time to end any suffering for Frankie. And since he’s my first dog, I haven’t had to make such difficult decisions in the past. But I’ve had the privilege — it honestly felt that way — of being involved with the decision my friend Karyn, a greyhound rescuer, made about her beloved first dog, Painter. I only hope someone gives me the type of sendoff Painter got. Painter, celebrating his birthday. And, no, the hat's not Photoshopped on! When he was 11 years old, Painter developed spinal deterioration, which made it difficult for him to walk. Karyn tried everything, including acupuncture, but finally nothing worked any more. It got to the point that, when he crouched to go to the bathroom, he had trouble lifting himself back up. Unable to carry around a 75-pound Greyhound and distraught to see him losing his dignity, Karyn finally called the vet to come over and give him an injection. The day of the appointment, Karyn was too upset to think about preparing food, so I brought over a couple of burritos for us, a bacon cheeseburger for Painter. Sure enough, Painter perked right up, scarfing the burger in three bites. Afterward, he farted contentedly in Karyn’s arms until the vet arrived half an hour later to give him an injection — also while he was in Karyn’s arms. Painter had a good (post-racetrack) life and a good death. Deciding when to let go is one of the toughest things any pet lover has to do. I’d like to know how others arrived at that decision, and how they felt about it. Remember, this is a guilt-free zone. If you think you waited too long, get it off your chest and vow to do better next time. I made this decision just this week and a vet is coming on Wednesday to let my Sparky go…..she’s a month off 17 and is sadly having mini-strokes way too often now which are very upsetting and disorientating for her. I’m heartbroken but decided on Wednesday night as she went through the 2nd episode in under 2 weeks….time to let her go and let her go with dignity-she deserves that at least. Oh, Lynda, my thoughts will be with you on Wednesday. I’m sure you made the right decision, which is far tougher on you than it is on Sparky, who will not fear or dread what’s coming up. While she won’t suffer any more, I know you will for a bit. Anyone who’s read your tweets knows how much you care for that sweet girl. What a lovely post — and what an excellent last meal to bring Painter. For various reasons, I’ve never had to make this decision (parents handled family pets, one cat died naturally, another cat had to be put to sleep while we were out of the country), and I dread the day. We’ve been with the same (excellent) vet for years, in sickness and in health, so we’ll have good advice when the time comes. Thanks, Mary-Alice. I trust one of my vets to give me good advice too — and I know my dog buddies like Karyn (see next comment) will help get me through the experience. Thanks for posting Painter’s story. I hope I can end my life with a bacon cheeseburger (something I never eat in real life) and a piece of red velvet cake with cream cheese frosting and champagne of course. Why our dogs can die with dignity and we cannot is an anomaly. It was a thoughtful act and hope to be there for her when she needs that return favor. I have another greyhound – Lily – who is 12.5 years old now (the age that Painter died) but Lily is doing well. When it’s her time, I hope she can leave planet earth the same way. Karyn, I like to keep my comments section honest. I have in fact shared at least one bacon cheeseburger with you — at Kingfisher, remember? I’m not sure if it was bleu cheese or gorgonzola, though. I also once wrote a story about last meals and what I would want for mine. For sure, carrot cake and pecan pie would be involved. Painter almost left the world with a Sonoran hot dog — without the toppings — for his last meal. I was going to get one for each of us. It was probably good that the Mexican place I went to didn’t have them, though a frankfurter with the bun is a pretty good send off for a dog, too. The other part of the story that I didn’t include was that I was in the other room with Lily when Painter got the injection. She definitely had a response to Painter’s departure — a mild shudder, a look of surprise, subtle but enough to make it clear she was experiencing something. 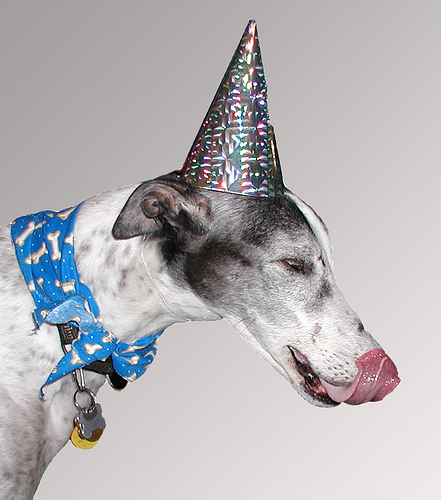 Our adopted X racing grayhound, Ace, was four when we gave him a home. Ace was so muscled, and big, that his haunches bulbous, shoulders, neck and back rippled with muscle, then there was the skin, a beautiful red fawn. Ace was hilarious in his innocense of curbs, or that you can’t actually run all the way across a swimming pool. He was content to hang with our rescued Great Dane, leaving no room on the sofa. The dachshund always bossed the big boys around, only Beebe’ would come complain about things like, Spike sitting in a dishpan of food , which he’d reached by climbing a stepstool, and refusing to let the big boys eat. Spike is a whole nother story. Ace was entirely an easy going, sweet, blissful dog. He loved to get out and run, but I had to be careful because he’d overdo and his muscles and tendons would flare in pain. After two years, he began to limp on his right rear leg. The Vet’s x-ray revealed the fan like array of bone cancer. My friend, and vet came over, hiding the syringes in his waste band. We laid him on a white sheet and petted and stroked him, and told him we would never forget him. It is stunning, the suddeness of the passing of the spirit. Both the Vet and I cried hard, snot down your chin hard. Then my friend wrapped my big Ace (90 pounds) in such a small and pretty shroud, and took him away. Having Ace taught me the loving kindness of the sight hound, Beebe’ showed that a dog tortured and left to die on a Florida street, can grow to be impressive in presence, yet always a happy guy and a true gentleman. And Spike, the abandoned sick puppy, came home to remind us to be audacious, rowdy, ironic, and ridiculous. Glenda, thanks for sharing the story of your wonderful dogs and what they meant to you — and in such a vivid way. And thanks for coming to my blog. I know you often comment on Facebook, where I forget to go for days if not weeks. I always appreciate your engagement with the goings on of Frankie and friends. This one is so hard. What with rescuing elderly and ill dogs, I have had to make the decision for several dogs. But the ones that still leave me in tears today were for the number 1 dogs — Alexander, a terri-poo who joined my life at 10 weeks old and almost made it to 18, and Teddy, my beloved first smooth fox terrier, who I got at 7 weeks old and who was only 9 when I lost him to lymphoma. A number of friends were not shy about telling me I should put each dog “out of his misery” long before I did so. I figure that a dog who is still enjoying his walks and his treats and his cuddles still had a good quality of life — even if he is a little on the senile side, as Alexander was or looks bad, as Teddy did (the lymphoma was causing one eye to bulge). But in both cases I castigated myself for perhaps waiting too long, because I had to be sure it was time in order to bear taking that last trip to the vet. But my guilts are much bigger — I had no idea that fox terriers are prone to lymphoma or that some believe invisible fences and other radio collars can cause cancer, mainly lymphoma. I thought I was doing the right thing when I installed an electronic fence in a hard-to-enclose yard (this was 1995-98, still pretty much the dark ages for positive versus negative dog training). Now I would never even consider a radio-controlled Rover. 1) Make sure you have a sympathetic vet. My regular vet and I had decided, after much consultation, to only give Teddy comfort care. The evidence was that canine chemo for lymphoma would extent his life only another year, much of which would be spent suffering from chemo. Unbelievable as it may seen, the vet on duty the day I decided it was time, while I was holding Teddy and weeping steadily, strongly implied I could have saved him by acting earlier. I don’t know if I could handle doing the deed at home. 2) Do whatever comforts you. I have never admitted this in public, but I slept with Teddy’s ashes for months — it made the empty spot on the bed feel less empty. 3) Don’t talk to the kind of idiots who think someone was “just a dog”, Until they have been there, they are not going to understand. What they will do is upset you. 4) Pay extra attention to any other creatures in your care. When I had Alexander put to sleep, my little black schnauzer Cleo was inconsolable. She hid under furniture and refused to eat for weeks — until Teddy arrived. With a fox terrier puppy in the house, no one had time to be depressed! 5) Don’t push yourself or a partner into getting a new pup if you are going to resent him/her. While I strongly believe that adopting another pal is the only long-term remedy for one’s grief, I also know that timing can vary from one person to the next. If one half of a couple is grieving and resentful, the new dog will be the innocent victim of the struggle. He/she won’t understand. It was the luck of the draw, not a partner, that landed William, an 8-month-old fox terrier pup, in my lap within days of losing Teddy. It took me a long time to see past “not Teddy” and enjoy William’s very differemt personality (FYI, We did get there — William is sitting on my feet as I type). 6) Tears are okay. When you can simultaneously smile and weep at a dog’s antics, it’s time to launch a new adventure with a new pal. I can think of no better expression of one’s love for a lost friend than rescuing another. Thanks for this, Rebecca. Remember — guilt free zone. You are perceptive but, as far as I can tell, don’t have fortune telling abilities. How could you possible predict the health problems associated with electric fences (which, sadly, are still quite popular). Nothing has surprised me about the insensitivity towards the bereaved since the rabbi I hired to say a few prayers over my mother at her graveside castigated me because I had her cremated — because that was what she requested. That first commandment… honor thy father and… ? Don’t get me started! But it’s true, people are even more insensitive on a regular basis when it comes to pets. That’s why your point #3 is so important. Rebecca, I didn’t sleep with Painter’s ashes under my pillow but for months I slept with his dog coat under my pillow. Someone made that coat for him (red/white/blue) and had his name on the side. It was sweet. I still have it of course. I never washed it. For awhile it used to smell like him but that smell has now gone. I also kept his booty. One time he had to wear a booty and it was silver metallic & black. I still have it. He hated that booty. I would labor taping it on with vet tape and walk out of the room for a minute and he would remove it like Houdini. Lynda, you’re doing the right thing for Sparky and glad you gave yourself a few days to spoil her and love on her more. I have some of Sammy’s hair in a zip lock bag and sometimes when I feel really sad, I open the bag and stroke his hair for comfort. I also feel better talking about how our new dog, Sugar Bear will find her match made in heaven when she meets Sammy in her next life. I’m not sure which is worse — a death that you prepare for or one, like Sammy’s, that comes as a sudden shock. While you have the comfort of knowing Sammy didn’t suffer, you don’t have the solace of having been able to say good-bye on your terms. I’m glad you’re getting some comfort from Sugar Bear! Knowing when it’s time to say good-bye is always an emotionally difficult decision. So far, I’ve only had to make the dreaded decision once. My eleven-year-old cocker spaniel, Sandy, had a variety of health issues – incontinence, a mysterious cough no one could figure out, and not one but three different eye diseases. My decision to put her down came when my vet said the only way to relieve the pressure building up inside her eyes from Glaucoma (and the subsequent pain she was feeling) was to surgically remove them. On a slightly different note … I think there’s a lot of pressure nowadays from the veterinary profession and other owners to do (and spend) whatever you can to save a pet’s life. And if you don’t drain your bank account in the process you’re made out to be the bad guy. When making the decision to euthanize a pet, quality of life should be first and foremost. However, finances play a big role too. Last year I interviewed a man who is $20,000 in debt from trying to save his cat’s life. Veterinary medicine has advanced so much in the last decade with better treatment/surgical options that I think it’s increasingly getting harder for owners (both financially and emotionally) to say, enough is enough. Thanks for this, Maryann. I’m so sorry that poor Sandy had so many health problems but obviously you had no other choice than to make the decision you made. Dogs don’t have a problem with being blind if they are born that way or lose their vision gradually, but to have it occur suddenly, through surgery… that would be very frightening. You pose a very interesting question. I think pet insurance helps owners from having to go into debt but for those that don’t have it… Well, I don’t have any direct experience, so let me see if I can get others to respond. Thank you for sharing this story and the discussion. It affects me a lot. We know that when you take in an animal it comes with a huge responsibility. Therefore our pets should not be treated differently then I would treat myself (or the rest of my family). Food, shelter, visits to the vet and TLC. But now you touch a very good point, shouldnt insurance be a part of this list? Yes it must if we wantt o live up to our responsibility, as you could still have a treatment to reach quality of life, at “any” expense. And when I have insurance on my own health, my pets should have too. Things can change down the line, and I am not blaiming anybody not having the finances to have an insurance, that they treat there pet badly. Only stating that if you can afford it, do it. Prevent getting into the situation where you have to choose between your pet and money. Or between your pet and the rest of your own life, like in Maryann’s story. Insurance is not the final solution, they are companies making a profit and will try to dodge their responsibility and make excsuses, so don’t feel comfortable. See it as something we have to do for our pets when we can afford it, and live up to our responsibility. When you cannot afford it, think twice, and prevent standing in the heartbreaking situation Maryann described about the man trying to save the cats life. Insurance, as both you and Maryann note, is not a perfect solution. I can only look back with 20/20 hindsight and wish I had gotten it for Frankie before he was diagnosed with diabetes and before… well, before he gets older. I didn’t know any better — insurance was not widely popularized even a few years ago — so I’m not berating myself but I do try to suggest that people look into it to see what their options might be. Thanks for commenting. It’s always nice to see new people on my blog, even — especially — when discussing such a difficult subject. The value of money versus the quality and length of life left of a beloved pet is so hard to determine. It’s one of those few moments when everything in life is gray, no such thing as black and white. Finances are certainly a huge consideration, especially in multiple pet (& human children) households. For many people, myself included, my pets (Boxers & cats) have been my “kids”. They require research on a healthy diet, daily exercise, emotional and intellectual stimulation, and LOTS of love and attention. As such I would try to do anything I could for them. However, that begs the question of when enough is enough for them. When does hope become lackluster pain and melancholy for your beloved companion and when does nature retain, or rather ‘regain’, its edge over nurture? It is tough. You just don’t know. Even when logic and realism stares you in the face, it is tough to actually KNOW. I still don’t know after going through it last year. After a month or so of going from pure hope that this was an ever-so-small issue to facing the reality of “untreatable, incurable brain cancer”, for us the end of hope was actually a blessing because the reality was that good days were incredibly numbered. I always heard the rule of thinking of three things that your pet enjoys doing and as they dwindle away, that’s when you know. For us during the long process of getting a diagnosis, the three things were in our minds – and we saw them dwindle away – but it was tough because we had hope that things would eventually get better. Once we got the cancer diagnosis with pretty much no hope for treating it, we gave him meds to at least give him those three things for a small amount of time. In our case, the end of hope helped our decision. I can’t tell you how much we cherished those final days – and with the right meds being able to enjoy his three things yet again. It was pure joy to hear him purr, to see him chomp on turkey, to enjoy being brushed. When one of the things left – enjoying his treats – we knew. With the fall of one of his favorite things came the intensity and the frequency of his seizures. We had the vet come to our house. He passed away sitting between us on his favorite blanket which was situation in a huge sunbeam and watching the birds outside. His feline and canine siblings all said goodbye. It was the right thing to do. Even then, we faced our own doubts. He could still do two of the three things, we knew that those would eventually dwindle away too. We’ve seen it before he was on the right meds. We knew it would happen quickly. Was it better to let him go while he still had a little enjoyment in life or have those things taken away from him while he was living? The first option is the obvious choice but not when you’re going through it. The first was better for him. The second was better for our peace of mind that we had done everything despite his happiness. In the end, his happiness won out for which I am proud and grateful that we made the right decision. Thank you so much for sending in your story. I never heard about the “rule of three” but I’ll remember it now. I’m glad you feel satisfied with the decision you made. Clearly it was the right one for all of you, now that you can look back and see that prolonging your cat’s life would only have kept him with you for a bit longer — at his expense. All of these posts are so insightful, and for me, painful. I fear I may be facing 16-yr-old Archie’s final days. But are they days, weeks, months, or years? He’s always been so vigorous and so charismatic (Edie will attest). Now he rarely lifts his previously obstinately cheerful tail, he doesn’t notice that he’s leaving droppings indoors (previously obsessively fastidious), he doesn’t pick up his toys, he doesn’t eat his meals no matter what I give him. But he puts his little paws on my neck and sighs contentedly as we sleep, he tries his best to continue to stalk me at all times and looks at me with disbelief and scorn if I seem to be planning to leave him home alone. I will now look for the three things and monitor them. And I’m taking him to the vet tomorrow to find out about the pesky droppings. Thank you all. My heart is simultaneously aching and uplifted, if that’s possible. It’s so hard when it comes to a dog like Archie — who remains charismatic! — who is not really sick or in pain, just fading. Some dogs go out gently; we can only hope that happens with Arch. But I know you’ll do the right thing, no matter how difficult. I agree …pet insurance could help ease the financial burden. But it depends on the plan an owner picks … some exclude diseases like cancer, which is expensive to treat. I was recently told it can cost anywhere from $2,000 to $10,000 depending on the type of cancer and treatment protocol. Yikes! Edie, as travel and classical music (horn player here) are my passions outside of my four legged kids, I’d LOVE to read other things you’ve written about your travels. If they’re even half as insightful, witty and interesting as your blog about life with Frankie and related topics, I’m sure I’ll be hooked. Since I’ve grown up with dogs literally from the cradle, I’ve looked back to see my evolution of emotional development on the human side regarding this topic. My dad’s Cocka-poo from his early teen years lived to be quite old, so Comet was around through my early childhood. When I was five years old Comet became quite ill, aside from becoming blind and deaf, she also had rapidly spreading cancer. My dad was devastated and knew the inevitable had to be done for Comet’s comfort. On a cool autumn Saturday morning I accompanied my dad into Comet’s veterinarian’s office. My dad had explained to me what was going to happen before we went, and my mom even tried to stop me from going with them because I was only a tender age of five years old, but I told my mom Comet and dad had guarded me and it was important that I was there for her and my dad. With little kindergarten me in the room the vet administered the shot and told us we had a few minutes “to say goodbye”. It was the first time I saw my dad cry and it was the first time I lost a beloved family member, human or non-human. My dad told me on the way out of the office Comet would be going to doggy heaven because she’d been an amazing dog to all of us and that’s where dogs go, just like humans. Now that I’m older I appreciate my father’s kindness in softening the blow for his child (me) and trying to put a heart warming spin on losing something close to us. Nearly 20 years passed until the next huge dog death. George the First, (I now have George II, named in his honor) a big fawn Boxer who was taller than the breed standard, weighing in around 80-85lbs. From the time I was 13 until the time I was 24 he was the family dog who had a relationship with each of us, no matter our place in life or if we were pack leaders or children. He loved us all and we loved him. Two weeks after turning 24 I got married and lived about 180 miles from “home” with my new husband, so I only saw my family every couple of months. George the First had even made the trip up for our wedding with the rest of the family, and sadly his age was showing through. I still called him “puppy” even though he was nearly 11yrs old. A few months later, in the summer of 2005, George got sick with pneumonia. Concurrently his vet had found he was also suffering from a common Boxer heart condition. His treatment for the heart condition could not start until the pneumonia had cleared up. My dad went on a business trip and left my mom home with my youngest brother, then 12yrs old. One night George was coming up to bed as normal, and as he reached the landing at the top of the stairs he started to aspirate and made it as far as my parents’ bedroom, where he collapsed and died right there of a heart attack. I felt bad for mom having to deal with the logistics of moving an 80lb dog from the room and sorting out his heavy remains at night. Luckily one of the neighbors who was a close friend of my dad’s came over and helped my mom. When my baby brother called me to tell me what had happened I realized I could never go “home” again because it would never have the same vibe. Oddly, it was NOT getting married that made me realize I was a bona fide adult, but the passing of my favorite dog ever! Weird even to me, the one who experienced the emotional revelation. I was happy that George the First was able to go on his own terms, if one can call a heart attack that, and that he died in his time, not requiring commonly needed/used euthanasia. Anyone who has a Boxer knows they’re very intelligent and independent minded, yet *totally* devoted to their family pack. It’s only fitting that one should pass on his/her own manner close to their pack, as they so love to live their entire (healthy) lives. Three years passed before I got another mammalian critter, only keeping a single Beta fish in a bowl. Eventually I did get a kitten (Gracie Cat), followed by a Boxer puppy (George), then another Boxer puppy (Molly), and more cats, all with their own stories of course. Now I have a full house again. Knowing that their lives are so short I gushingly treasure each and every day with them and love each of them for their own unique personalities. I’m thankful for the immense joy they bring to my heart and vitality to my life. I try so hard to repay them in love, care, kindness, and the necessities (routine vet care & a proper diet) to ensure longevity and prosperity for them all. FYI- my mom still has her scrappy, now 15yr old, Yorkie and two rescue dogs, one mutt (3yrs old) and one Boxer (4yrs old). All seem to be doing well and enjoy visits with my menagerie. Ha, I knew you had for more to say than you could fit on Twitter! Seriously, thanks so much for sharing the stories of the pets of your childhood and the rite of passage that George I’s death provided. I’ve got to agree that a heart attack is “on his own terms” — in part because that’s how my father died, suddenly and quickly at home. My mother was not a pet person — to put it mildly! — but my father was and your story of the trip to the vet to say good-bye to Comet also reminded me of a kindness I only became aware of in retrospect. My father used to tell me that the dime store turtles I had were “sleeping” and then would rush out to replace them, which I only discovered years later and think was very sweet. Kind of the opposite of your story, I know, but I think the common theme is an element of tenderheartedness. Thanks too for your nice words about my writing (I had to try very hard not to thank you for them first)! 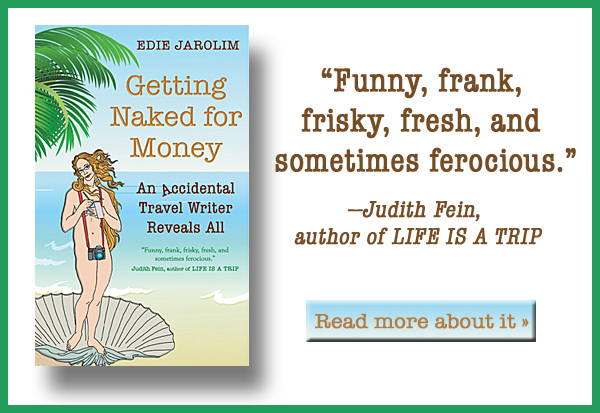 I haven’t updated it in far too long but you can read some of my “evergreen” travel stories on http://www.ediejarolim.com. There’s one that everyone gets a chuckle out of… you’ll know which it is as soon as you see the topics. The more I have thought about this discussion, the more I have wanted to revisit it with a slightly contrarian addition. Am I the only one who is at least a bit troubled by the rapid escalation in what constitutes being a good dog owner? It really was not that long ago that a good and loving human was one who supplied basid vet care — such as shots — supermarket kibble, and regular walks. Now it seems like we aren’t doing enough unless we can afford private kindergarten and doggie orthodonture for our best buddy. Of course, I would never, ever suggest adopting a dog to someone who is going to let him/her run loose and ignore the subsequent broken leg. And I recognize that the rapid rise in canine life spans can be at least in part attributed to good vet care and improved nutrition. But I think we are rapidly pricing conscientious would-be adopters out of the mutual joy of lfe with a dog — particularly those of us on fixed and limited incomes — if we assume the long-term costs are going to rise to chemotherapy and major surgery. I know one “rescuer” who would only adopt “her” dogs to childless (or empty nested). white, upper middle-class couples who lived in the pricier suburbs. And she regularly had less-than-perfect rescues killed. Okay, she was competing for the Cruella de Ville of dog rescuers. But in a world where millions of dogs are slaughtered annually for lack of a good home, maybe we should back off a little? You’re not being contrarian but consider this: Most people can’t anticipate the illnesses of their dogs or how deep their connection ends up being. So they spend more than they can afford. If you had told me that Frankie was going to develop diabetes and assorted unexplained illnesses that would cost me a few thousand dollars a year (I just did my taxes and was wishing I could claim him as a deduction) I would have steered very, very clear of adopting him. As for supermarket brands — well, they’re not always cheaper than the good varieties (especially those that are labeled premium) and they’re often filled with things that make dogs sick. Ditto shelling out for training — which has prevented a lot of dogs from getting returned to shelters or killed, etc. etc. So I think you’re misrepresenting the position of people who spend money wisely on their dog — we’re not talking orthodonture but treatment to prevent periodontal disease, which can be deadly — or foolishly, in spite of their better judgment. But not spoiled yuppies. No, no, no, I was not meaning to diss people who spend much more than they can, by some judges’ standards ‘afford’ on their dogs (guilty right here). What I was trying to talk through was my concern that potentially good and loving owners are being scared off of offering a home and a life to a dog who would otherwise be executed at a “shelter” because we have such high expectations for what a dog needs. Training is good. Specialty medical care, where needed, is vital. Professional grooming is a plus (even a necessity if you have a dog with an easily tangled coat). But many dogs live long and happy lives without needing any of these things. I suspect that anyone involved with rescues and/or shelters still sees far too many dogs who are dumped after being neglected, if not outright abused. So we worry about educating people to understand that dogs are living creatures with physical, mental, and emotional needs, not live stuffed animals you can ignore whenever you want or toss aside when he/she needs his/her teeth cleaned. But we also desperately need more people willing to adopt dogs — particularly those pooches, who like some of us humans, fall into the category of “mature”. What I am trying to figure out is where realistic hits on the scale that begins with no dog care beyond cheap and indigestible kibble and ends with yuppy puppies. If I could have my way, every dog would find himself where a dog I called “Sky” wound up. He was a biggish minisature schnauzer, 11 years old, turned into a local shelter so matted his feet did not even touch the ground, terribly shy and generally neglected. He arrived at his new home — with a senior widow in Scottsdale — to find his food and water dishes already filled, and his new best triend so excited she was literally waiting on the doorstep for him! Those are the kind of happy re-beginnings I want to make as affordable and available to dogs and humans as possible. Because, pending the happy day when no irresponsible owner breeds unwanted puppies, we simply need more homes where potential owners are willing to open their hearts to a new friend.